US SARASIN ACTOR | Le spécialiste de la motorisation de robinetterie industrielle. The industrial valves automation specialist. 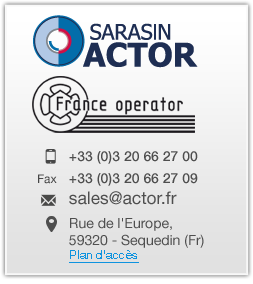 Since 1952, SARASIN ACTOR trade marks (France Operator, SRD, JAPA, Saint Chamont Granat…) are specialized in the automation of valves for Gas, Oil, Energy and Water markets. Our company offers technical and economical solutions tailored to your needs with a constant focus on Quality and Service. The company is mainly export-oriented, especially to Africa (Congo, Gabon, Nigeria, Algeria…), Middle East (UAE, Kuwait, Qatar…), India, Brazil and Indonesia. After-sales service is available 24H/24H for any troubleshooting or equipment renovation. TOTAL E&P, GDF SUEZ, KOC, QATARGAS, NIGC, NIOC.